Are Online Distractions Hurting You? I could never seem to get everything done. I was working from morning to night and my to-do list just kept getting longer. Then, I discovered that a major root cause was online distractions. I had no idea that they were making everything take much longer to get done. Even worse, bouncing from task to task negatively impacts the quality of our thinking. (I could feel it affecting me! ) This puts us at a serious disadvantage. Today, we need to be at the top of our game to create more opportunities & close more deals. To find out if distractions are causing problems for you, take this quiz from More Sales, Less Time. Mark an X on all those that apply to you. Be truthful! __1. I keep checking to see if any new e-mail messages have arrived. __2. I frequently bounce from one sales activity to the next (e-mails, research, phone calls, CRM updates, proposals, social media). __3. Being “crazy busy” is exhilarating. I love, love, love it. __4. Even if no one interrupts me, it’s hard to stay focused on a task (book, report, study) for more than half an hour. __5. I sit at my desk staring at screens for long periods of time during the day. __6. Thirty-plus minutes can easily disappear due to following interesting links. __7. I’m under lots of pressure (self-imposed or management) to get results. __8. My to-do list feels like it’s never ending. __9. I get irritable or bored when I can’t check e-mail or go online. __10. When working on something tough, I catch myself going online whenever I get stuck. Count up your Xs. If you only have one or two, you might be a bit distracted but doing fine. 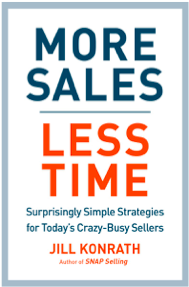 But if you’ve checked many of them, it’s increasingly hard for you to sell more in less time. Perhaps it's time to do something about this!